The International Association of Registered Financial Consultants (IARFC) has created an Ethics Approved Renewal Program designed to promote adherence to the Association’s Code of Ethics. This program scrutinizes the practice history of each member and will award recognition to those who serve the public’s interest when dealing with their financial future. Effective immediately, the IARFC Team will be reviewing all membership renewals submitted to the Association and rewarding members for their long-term commitment to the IARFC Code of Ethics. They will be checking FINRA records, state licensing records and even conducting an internet search of each member’s name. Members will need to have a clean record for the preceding five (5) years in order to qualify for the Ethics Approved Renewal. Members who qualify will receive an embossed seal stating they are “Ethics Approved” with the year of the review and is effective for two years. The IARFC, founded in 1984, is a non-profit credentialing organization formed to foster public confidence in the financial planning profession. Their professional designation – the Registered Financial Consultant (RFC®) is awarded to those consultants who can meet the high standards of education, experience and integrity that are required of all its members. 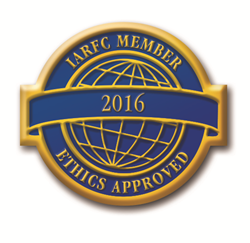 For questions about the IARFC or to find a consultant that is “Ethics Approved” contact us at info(at)iarfc(dot)org or visit the Association website at http://www.iarfc.org.